Based on your experience and studies - is it better to buy a stock whose SCTR recently breaks above 60, because of more potential gains or is it better to buy a stock ranked in the high 80's or 90's? I have not been able to find an article in the system that shows the historical returns over any time period for any particular score range. Any help would be appreciate. I would say there is a great deal of variation in SCTR behaviors. 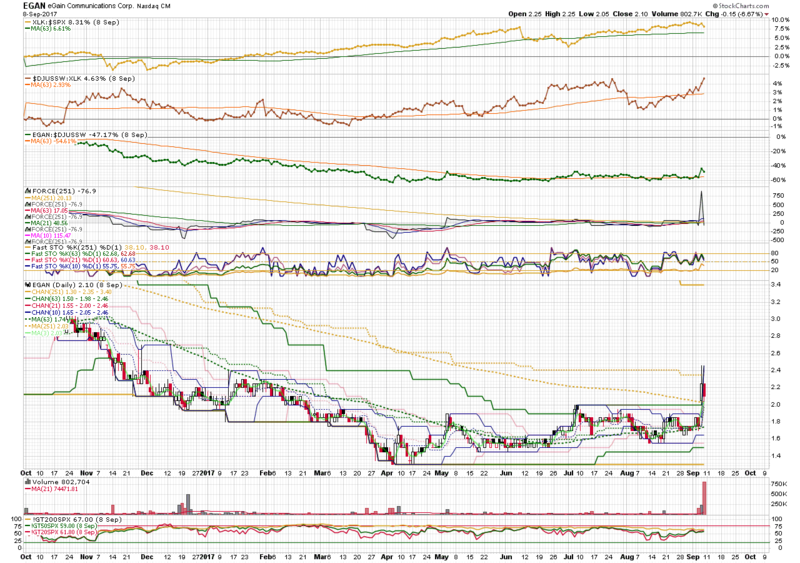 For some stocks, SCTR gets up to 90ish and keeps knocking on the ceiling as the stock keeps climbing (BA). For other stocks, SCTR wiggles around in the 30s and 40s for a while, then breaks 50 and its off to the races, at least for a while (FOXA). It's not uncommon for stocks to peak in the 80s and 90s instead of settling into an extended trend (TGT ?). It's probably worth checking out stocks that cross above 50 or 60 on the SCTR scale, but you need other tools to decide whether it's a good trade. One that I've come to like is Price Performance with 63 day moving average or RS - the price performance ratio is between the symbol and its INDUSTRY. So, for instance, FOXA is assigned to the Entertainment industry (a cyclical), so the price performance indicator would be FOXA:$DJUSBC - or, you can use the generic symbols $SYMBOL:$INDUSTRY. Then in advanced option add a simple MA 63. If you set up a nine month or so chart with this indicator, you will see from May to September the RS line (the price performance ration values) was mostly below its falling MA 63. Then in October the RS line edged over the MA while price seemed to stay flat. Then in November the stock broke out for a nice 10-11 point run. Meanwhile, SCTR didn't tell you much (there is a divergence -price drops in October and SCTR does not - but its hard to see). So, Price Performance gives you a little heads up (RS getting above and staying above its falling MA) that SCTR doesn't. Of course this is a cherry-picked example. Stocks can rise when RS is falling (that means other stocks in the same industry are rising more, so maybe you should look there). But when it appears, it seems to work reasonably well fairly often. If you want symbols that have deteriorated, you would multiply by a value less than 1, like .95 or whatever and change the ">" to "<". Thanks Mark , I will try this. Regards. Hi Mark, I tried this and added another filter for Volume but it's ignoring the volume expression. What am I doing wrong? Thanks. The volume number you specify should be the same length as the volume reported, not truncated like market cap - so you are asking for average (AVERAGE - not any particular bar) volume over ten thousand shares. run the scan as of last close, not most recent update to get the same result. Hi Mark. I re-ran after today's close and got more reasonable result as you indicated above. Sorry, I only do answers on the forum. I get enough requests that it would take up too much of my time. Also, a question that one person has probably many others do, too, so the forum is much more efficient. The forum is pretty anonymous, so if you are comfortable doing so, ask away (maybe under another pseudonym now). I don't know what kinds of questions you have in mind, but if you were thinking I could give actual buy/sell advice (this is addressed to others as well) for your particular circumstances, I'm not qualified to do that and would not want the responsibility for doing so. My purpose here is to help people find their own way, not to suggest what they should or should not do with their money. Hope that helps. another fun SCTR option is to scan for SCTR over time. will give you MidCap stocks that have maintained a SCTR greater than 50 over the last 200 days. I have a question about how quickly the SCTR changes over time. The key reason for my asking is that I would love to use SCTR more as an investment tool than a short-term trading tool. I am looking for a measure that is relatively stable in giving me momentum and relative strength as a final filter on my screening process. As an RIA, I am trying to build portfolios for my clients and am not interested in trading in and out on a daily, weekly or even monthly basis (though I will trade if the opportunity presents itself, of course). So, back to the question. How radically and how often does the SCTR typically change? How often does the SCTR for a stock change by great leaps. I noticed, for example, in the end-of-day scan from last week, a number with significant drops...I presume from one day to the next. One, UHS, has the SCTR fall from 80.4 to 57.8, which seems like a significant change in one single day without (what I would call) a corresponding significant drop in price (the price fell from around 122 to 118+ on Thursday). Thanks for your input and time in responding to my query. You can add SCTR Line to you charts to see how it behaves. It's in the Indicators drop downs on the Chart Workbench in the "S" s.
SCTR ranks a stock's performance vs. its peers. So a SCTR can change due to activity in those other peer stocks, not just the stock itself. For your purpose, it might be helpful to use a longer term MA (say, 63 - 3 months or one quarter, or maybe 126, or 251) of the Price Performance indicator (in other words, a ratio of the stock and a relevant index, e.g. IBM:$SPX). If the Price Performance line (which is Relative Strength) is above a rising mid to longer term MA, the stock has been doing well. Crossovers above a falling MA 63 are often a prelude to a good rise. An excess distance between the rising RS line and its rising MA suggests caution. Thanks for the quick feedback. Actually, I have typically use a gallery view and the key things I am paying attention to there are the daily charts with the 50 and 200 day EMAs and the PnF charts. One of my grad school profs did a paper on moving averages and found that even a naive MA signal can improve returns versus buy-and-hold. Of course, sideways markets probably dramatically cut back on that, but that is another story. I am a little bit confused by the last couple of comments you have. I get the using the longer term MA (and I do). Where I am confused is the relative strength to an index. Are you suggesting setting up an additional line that measures the relative strength of the stock to a given index or sector? Honestly, that is what I thought the SCTR was doing, in large part. Where all of this grows out of is the book "What Works on Wall Street". A good read but for the momentum/relative strength factor, the only that that O'Shaughnessy wrote about was the 26-week and 52-week performance. He suggested buying stocks that fall in the top 10% of either or (ideally the 26-week relative price performance), as these stocks outperformed. While that sounds nice, I am trying to improve upon the methodology here and to find a signal that can get me out of stocks that have changed trend from upward momentum to downward momentum. I am trying to improve upon the factor idea of buy this list and hold it for one year and then wash, rinse, repeat to being able to hold on to winners and cut losers loose before too much is lost. Here is a chart to illustrate using the Price Performance indicator. The top three panels show (from top to bottom) sector to market RS (is the stock in a strong/improving sector); the second shows industry to sector RS (is this industry a leader in its sector); the third shows stock to industry RS (is this stock a leader in its industry). The third panel shows that the stock stopped losing relative strength vs. its industry in the last three months and started to get above its RS MA 63, which is just starting to turn up. Price is able to stay off its lows, and there are several high volume bars that don't make new lows (after April), which indicates there must be buyers - and they are probably smart money because retail buyers don't buy in down trends. This is a "buy emerging strength" strategy, and it is risky from a long term performance perspective, because it can be hard to tell the winners from the also rans at such an early stage. BUT - if you do see significant strength subsequent to a set up like this (good buying under a falling longer term MA, improving RS), it is a strong bet. Look at the current chart for this symbol. Okay. I was on the right track with what I thought you were getting at, but did not quite follow until now the three different levels of comparison. That makes a lot of sense and does go further than what O'Shaughnessy espouses. You are essentially saying compare sector to market, industry to sector and stock to industry and buy the top company(ies) in the strongest industry in the strongest sectors. O'Shaughnessy's method is to simply buy the stocks with the highest relative strength. While I get O'Shaughnessy's ideas, I still think there are better ways to capture momentum and to capture when momentum shifts, allowing an investor to cut and run before it's too late. The upshot of what I think you are saying (from this and the previous response) is that, while SCTR is a good tool, it can be a bit limited in that the number can change dramatically in the short-term which could lead to either getting in too early or exiting a position too early. The SCTR should be used perhaps in conjunction with other measures of momentum/relative strength rather than as the sole means to evaluate momentum and relative strength. Well, the chart above is NOT an example of buying the *strongest* stock. It is an example of buying *emerging* strength i.e. bottom fishing, in a strong sector in a reasonably strong - but variable - industry. Other stocks in this sector were doing much better at the time this stock started to show strength. Exiting a stock is much trickier. When you want to get into a stock, you have the luxury of waiting and finding other situations if it doesn't work out. If you choose not to buy something and it goes up, you have lost an opportunity but not actual cash. Once you are in a stock, you have to be right or lose actual money (or gains). The time to sell is when price stops making up side progress in spite of high volume, or it makes new highs on low volume. Either one can happen before the longer term trend actually turns, but it protects gains. Unfortunately, it can be hard to explain to people why you sold a stock that is not actually going down yet, but it protects profits. I think that SCTR is a good tool, as is the Chande Trend Meter (CTM). As with all tools, it's what you make of them. I think there was a recent blog post on using the right tools for the right job. The RS comparisons are good things to be aware of but the actual stock PRICE action, is the only way I make actual money. Indicators can be helpful for warnings, but price channels and support and resistance levels are probably better places to focus, in my opinion. Momentum strategies are really tough. I find O'Shaughnessy fascinating. You may note that in practice, his funds are managed using a combination of factors. Like Value and Momentum. Or Yield and Momentum. And remember, NOTHING works well ALL the time, but, if you have a sound strategy, and a system that you can actually follow, you will do well over time. A system is likely to produce multiple opportunities in various sectors and industries. RS is helpful in selecting between them. But I agree, price and volume are the best indicators for timing entries and for distinguishing the better opportunities among stocks with similar RS.